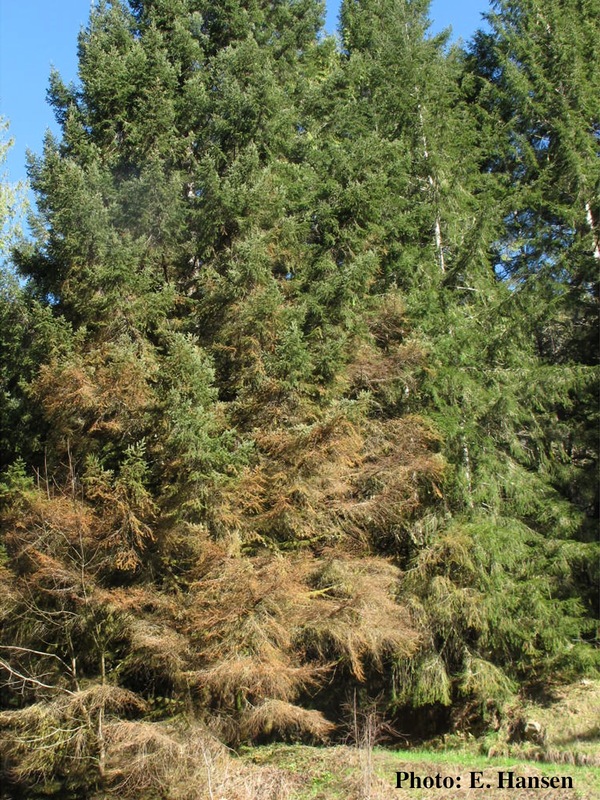 Upper: Red needle cast symptoms on Douglas-fir in Oregon. Lower: Radiata pine trees affected by red needle cast. P. pluvialis appears to be part of the native forest mycota of western Oregon. The impact of its association with Douglas-fir in Oregon has yet to be elucidated, but observations suggest there could be an association with lower canopy needle loss in dense stands located in humid areas. P. pluvialis might reduce the success of natural regeneration of Douglas-fir under dense stands. In New Zealand the impact on plantation radiata pine and Douglas-fir is of concern to forest growers in high disease- prone areas due to growth loss following needle cast (Ganley et al., 2014). Needle infection of radiata pine is characterized by the production of a resinous band which extends to pale-olive or khaki colored lesions which closely resemble those reported for P. pinifolia infection of radiata pine in association with daño foliar del pino (DFP) in Chile (Durán et al., 2008). For P. pluvialis infection, lesions are most commonly observed in the basal portion of the needle near the fascicle sheath. Needle infection of Douglas-fir results in chlorotic needle mottling and canker development in seedlings (Hansen et al., 2014). Clusters of sporangia form on needles of Douglas-fir and radiata pine. In both species, infection is followed by premature casting of the needle which in Douglas-fir often happens while the needles are still green. The term red needle cast reflects the expression of red needles in the lower half of the canopy prior to needle cast, leaving a sparse internal canopy in both Douglas-fir and radiata pine when disease levels are severe. P. pluvialis infection may be distinguished from other similar needle diseases by the loss of all cohorts of needles, production of olive, resinous bands in the absence of fruiting bodies, and production of healthy needles with the new flush. Breeding for resistance is a long-term option for management of red needle cast in radiata pine plantations. Field and laboratory screening have shown that resistance to needle loss due to red needle cast is heritable. 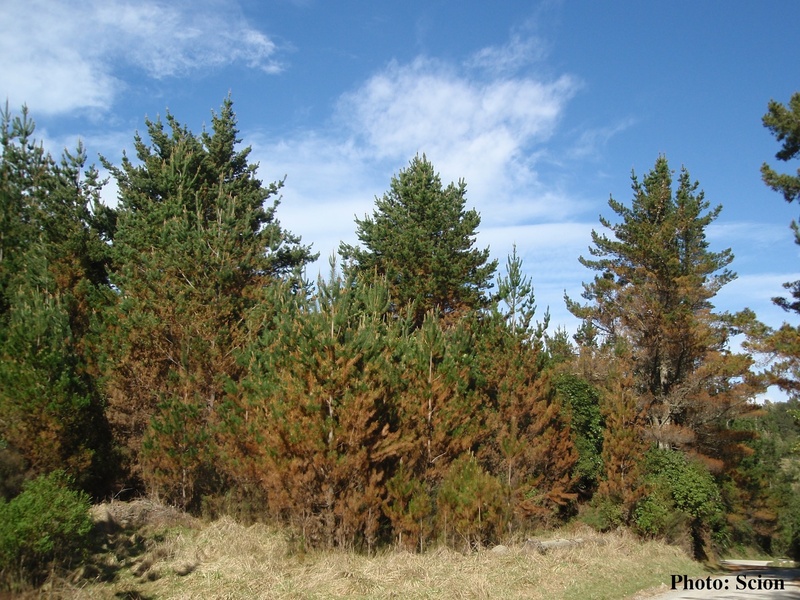 Screening is underway to identify resistance within current radiata pine breeding lines in use in New Zealand (Dungey et al., 2014). Phosphoric acid (phosphite) and copper have both shown promise for the control of P. pluvialis within plantation systems, but are yet to be applied operationally within New Zealand forest systems (Ganley et al., 2014; Rolando et al., 2014). For more information about Phytophthora pluvialis, visit our Pathogen, Education and Management materials, and Reference sections.